But instead of trying a fresh start the Prime Minister proved determined to pursue the same policies and nominated another austerity hard liner as a replacement. This action in its turn prompted the resignation of the Minister of Foreign Affairs, himself the leader of the junior coalition member (CDS - the conservative party). Since Tuesday the country is living one of its most awkward political moments, with a government that is in practice dead, with no clear plan for the 2014 budget and plenty of political soap opera along the way. In regular times the President would simply call a new election for Parliament, firming support for a new government, but this is seen as putting in check the chances of the country returning to the bond market next year. But with the current execution and debt numbers there's no way this can happen without some sort of external aid. Est-ce la fin de l'austérité à tout prix ? La démission, lundi 1er juillet, du ministre portugais des finances, a autant surpris qu'inquiété. D'abord surpris, car Vitor Gaspar était l'incarnation de la rigueur exigée par la troïka (Commission européenne, Banque centrale européenne et Fonds monétaire international), ce qui lui valait les satisfecit répétés de ses créanciers internationaux. Puis inquiété, car sans lui, la politique de Lisbonne en matière d'austérité risque quelque peu de s'assouplir, au grand dam de ses bailleurs de fonds. M. Gaspar le reconnaît lui-même : malgré une application stricte des recommandations de la troïka, "la répétition des dérapages a miné ma crédibilité en tant que ministre des finances", a-t-il admis dans sa lettre de démission au premier ministre. Et d'avouer, à demi-mot, que l'austérité n'a pas suffi : "les niveaux de chômage [17,6 % en mai] et du chômage des jeunes sont très graves [42,1 % en mai]" et nécessitent une "réponse efficace et urgente au niveau européen et national". This is another sequel of Austerity: it slowly decimates Democracy. It first erodes the parties that traditional meet the philosophical aspirations of electors and then blocks the regular public polling process. Portugal is at crossroads, the most crucial moment since the 1974 revolution: a choice between Austerity or Democracy. Either way there will be a price to play. Of all the bailed-out countries in Europe, Portugal had been the 'good student' – taking the austerity medicine its lenders prescribe. The government took it even further. It doubled budget cuts and tax hikes in the first year after its bailout. But economists now say that may have backfired. "The prescription itself was wrong," said Arlindo Oliveira, who heads one of Lisbon's top universities. "The government took it too far, was too good of a student. And I think it was bad for Portugal and ultimately will be bad for Europe." Oliveira has seen some academic departments gutted, as scholars leave for more stable jobs abroad. 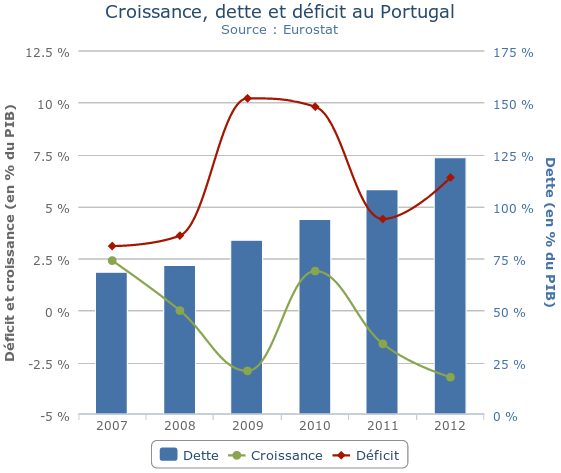 And he says austerity has done so much damage, Portugal may need a second bailout from Europe. "It certainly looks increasingly harder to pay the debt. So it looks like probably some additional measures will have to take place.". A second bailout is not the only option, Nicolas Veron from the Bruegel Institute told DW. In theory, Portugal's partners have several instruments to make the adjustment process easier for the country, he said: "They can review the conditions, restructure the debt, restructure the payment." But that, he added, requires political willingness on the part of Europeans. Both Portugal and the Troika had hoped that the country could regain market access as early as mid-2014. "Now the timetable is a bit delayed. But it doesn't mean that they won't manage to exit the current assistance program phase." The impact of the extended winter of 2012/2013 is still here, with gas reserves across Europe far from recovering the extra draw-downs. As usual it is those at the end of the pipeline at higher risk. The UK cannot possibly make it through a winter like the last, and even a more normal winter is not guaranteed to go by without trouble. The risk of power blackouts in Britain within 18 months has doubled since a year ago, according to the energy watchdog. Ofgem's warning increases pressure on the government to promote investment in infrastructure at a time when companies are closing gas- and coal-fired plants and consumers fear even higher bills. Ed Davey, the energy secretary, said he was putting in place measures to counter the threat but admitted: "Without timely action there would be risks to security of supply." The following bit of news went almost unnoticed, but is the most important piece of information on the Petroleum world in the last 2 years or so. Saudi Arabia is speeding its development of newer fields (read smaller fields) to substitute ageing areas (read large fields). In all likelihood this means that Ghawar, the largest petroleum reservoir ever found in the planet, is reaching its sunset. Wisely the Saudis are not going to hike total output, maintaining present levels for a few more years and postponing the day the kingdom will become a net importer. The time for OPEC to absorb market shocks seems rapidly coming to an end. Saudi Aramco plans to develop two less productive areas of major oilfields, industry sources said, as Riyadh takes care to maintain excess capacity for the long term, even while non-OPEC oil supplies are on the rise. The plan to increase capacity from Khurais and Shaybah by a total of 550,000 barrels per day (bpd) by 2017 will take the strain off Ghawar, the world's largest conventional oilfield, two sources familiar with the plans said. Such projects are not intended to raise Saudi production capacity beyond the current stated 12.5 million bpd, Saudi oil officials have previously said. After pumping its biggest fields at near record rates to make up for lost supplies from Libya and Iran over the last two years, the kingdom wants to focus on less productive fields to ease pressure on aging reservoirs to help keep their output robust. The IEA came out with a report full of optimism on renewable energy. I have grown accustomed to receive any projection from this agency with scepticism, and this one is no exception. With many governments now actively trying to delay the growth of these technologies, such outlook would call for more prudence. But as it has done before, the IEA may simply redefine the concept of "renewable" to meet its own targets. Global electricity generation from renewable energy sources will rise 40% in the next five years, outpacing natural gas, as China and other developing countries expand capacity, according to a report from the International Energy Agency on Wednesday. As the cost of generating power from wind, solar, hydro and other sources falls, renewables will account for nearly 25% of global electricity production by 2018, up from about 20% in 2011, according to the IEA’s latest medium-term renewable energy market report. Renewables will overtake natural gas and be double that of nuclear by 2016, said the IEA, which acts as energy policy adviser to 28 member countries, including the United States, Japan, Canada and leading European nations. Electricity prices in the US are about half of what they are in Europe, much due to cheap indigenous coal, and according to my acquaintances in the country, to the neglect of the electrical grid. Still photo-voltaics is slowly imposing itself in the market, with the same dynamics seen in Europe starting to take place there, just with a few years of delay. The following video discuss the coming growth of solar power in the US, but it is also interesting for the irrational scepticism shown by the host. As usual among the media, his questions are based on beliefs an not on anything concrete. Very important here the clear reference to off-grid systems starting to become economically feasible, something which the host is far from understanding. Finally a quick note on the changing politics in Iran. A de facto lifting of the embargo may be closer than one may think. In the end economics speaks louder than rethorics, an 80 million people country with dozens of giga-barrels under ground isn't easy to discard from the world economy, especially in a time of scarcity. CAMBRIDGE, Massachusetts - The election of moderate cleric Hassan Rouhani as Iran's new president sets the stage for fresh thinking on the troubled relationship between Iran and the European Union and the subset of Tehran's ties with Paris. A year on from the EU's July 1, 2012, imposition of an oil embargo on Iran, and given inconclusive nuclear negotiations, the question of what direction diplomacy toward Iran should take - tougher sanctions or a relaxation of tensions - has gained new urgency in European policy circles. A small yet significant clue that Europe may cut a new path away from the United States' one-track coercive diplomacy emerged last week. Britain's Supreme Court struck down the sanctions against a commercial Iranian bank, Bank Mellat, much to the chagrin of US officials, who denounced the court's decision and warned that the bank still remains on the EU and US sanctions list. The ruling has once again exposed the rift between national and trans-national approaches toward Iran, a split that is perhaps nowhere more apparent than in the dynamic of Iran-France relations, which have been suffering since 2007, when the ardently pro-Israel Nikolas Sarkozy took to the Elysee Palace. Have a nice wekend, enjoy the sun and the Tour.